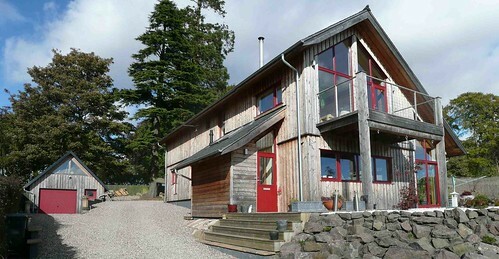 This 122 m² self build, passive solar house in Montrose was the winner of the Angus Design Award 2006. It is a post and beamSubstantial, usually horizontal structural member. structure of Douglas fir and has larch cladding with breathing walla bit of a misnomer. A better term is 'vapour open' because it is not air which is moving through the wall but water vapour. See more construction. The timber is untreated. The roof is of slate and carries a solar collector for domestic hot water.